George Clooney has strung together a long and impressive resume in Hollywood, gaining fame early on for his looks primarily but gaining recent accolades for his acting and directing skills. 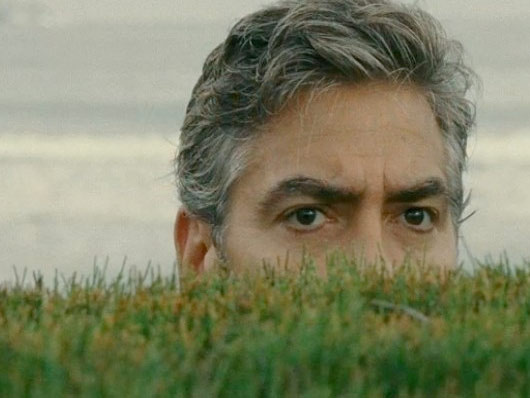 In Alexander Payne's The Descendants, Clooney takes his acting game to a whole new level as he embodies the character of Matt King, a father of two dynamic daughters who goes through an ordeal of having his wife on life support after a freak accident while finding out she has recently cheated on him. For once I watched a George Clooney movie and actually forgot that I was watching Clooney. In what I consider his best performance yet, Clooney plays an everyman character that is vulnerable and extremely interesting to watch. The pairing of this veteran's acting talents with the writing and direction of the elusive Payne (who hasn't directed a film since the 2004 classic Sideways) is a perfect formula that plays out in the lush visuals of Hawaii. Warning... there are very SLIGHT spoilers in the plot recap below. I don't give away key elements but a lot of details are mentioned. If you don't want to know much about the plot, skip the next two paragraphs. Payne's excellent story chronicles the actions of King, his daughters Scotty and Alexandra (played brilliantly by the talented and beautiful Shailine Woodley) and Alex's friend Sid as they roam around the Hawaiian Islands attempting to find the truth surrounding King's wife's affair. We get the back story of King early on and learn that he is one of the descendants of the Hawaiian royal family that dates back several generations. He and his large extended family on the islands are congregating to decide what to do with a large plot of prime real estate that has been bestowed upon them. It is up to King himself (appointed as the sole trustee) to make the final decision on which bidder to sell the land to. This decision ends up being balanced with breaking the news of King's wife's terminally ill situation. King has to go and tell family and friends about the imminent passing of a woman who he hates for realizing that she cheated on him. King's oldest daughter Alex who is in typical 17-year-old full on rebellion mode, hates what her mother did to her dad as well but must battle with conflicting emotions surrounding her imminent death. Woodley is remarkable in this role and helps give the entire movie an authentic family element. Her underwater reaction to the news of her mom's death in the house pool is incredibly realistic. The supporting cast of Scottie (Amara Miller), Sid (Nick Krause) and King's father-in-law (the always excellent Robert Forster) help glue the family tension and interaction together. Payne has become a master of letting characters' faces help tell a story. Just as he did in Sideways with Paul Giamatti and About Schmidt with Jack Nicholson, he allows Clooney to convey a wealth of emotion just by holding the camera on his face for an extra frame or two. Having been to Hawaii myself, this is without a doubt the most realistic depiction of our 50th state. Payne almost creates the islands as a separate character that weaves its way through the arc of the story. I expect Woodley and Clooney to be up for acting nominations next year. They both give some of the best performances I've seen this year. Payne's story and knack for balancing solid writing with simple and effortless visuals that highlight the scenery of life. Again, this is one of the more realistic portrayals of family dynamics that i've ever seen. You need to go see this movie (I would recommend going on the big screen to take in all of the great Hawaii landscape scenes) right away. Right now this is my 2nd favorite movie of the year and my 2nd 5 out of 5 JR rating for 2011. I definitely want to see this. Glad you liked it.